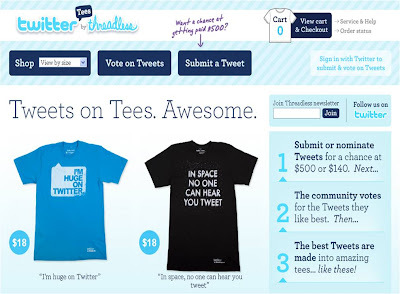 Threadless and Twitter have launched 'Twitter Tees by Threadless.' This takes Threadless' existing crowdsourced t-shirt model fully into the realms of Twitter, with official endorsement from Biz Stone and the Twitter leadership. 'Twitter Tees by Threadless' is a great example of driving value from social thinking, rather than social media (something that Neil has been talking about here.) Yes, the idea is based on social platforms and amplified through social sites - but the starting point is the thought of 'community creation' not media / advertising. The whole business model for Threadless is based on an implicit understanding of how the social web works and gives a great demonstration of how communities can be built and harnessed across an organisation. Identifying online enthusiasts and passion groups and then using social platforms to bring them into the core of a business would appear to be a more powerful way of utilising social opportunities than just running ads on Facebook - but it requires a good deal more commitment. The media aspect of social offers some exciting opportunities for brands, but the potential of the social web can be significantly greater if the power of community is fully realised.